Upon first entering the Tower of Magi there's only one place to go, which is down the stairs. At the bottom of the stairs is a man sitting behind a table. This is Vidrain, and he'll give you a general idea of where you can find X and Solberg. Also wandering around this area is Mahdavi, one of the Triad Mages. Talk to her about her job, and her research, and ask what she'd rather be doing. She'll give you a quest to read Erika's notes on the Vahnatai, which you should have already done. Tell her you've read them and she'll reward you by giving you another point in Vahnatai Lore. There are two doors and a passageway leading off of the southern section of this hallway. The doorway closest to Vidrain has two Chitrach Larvae behind it. The stairway right beside it leads to an open room with a Giant Intelligent Friendly Talking Spider, henceforth referred to as GIFTS. You can talk to Spider if you want some compliments. The last room has an Eye Beast in it. Now head towards the north and through the barracks, past the short antechamber and into the dining hall. There's a door leading off of it to the south, but this passage has been walled up. Go back to the antechamber and out the doors to the north. This is the entrance courtyard of the Tower of Magi. Go towards the east, right across the hallway and into another small courtyard. There's three buildings in this area. The first is the Alchemy n' Stuff. The woman's name is Brigid, and she'll sell you some alchemical recipes. The man is Vincent, and he sells potions. He'll also mention that he's worried that Linda is up to somethning dangerous, and tell you to talk to Kyanan. The second building is the home of Menlo the sage. She'll sell you three pieces of information and also identify your items. 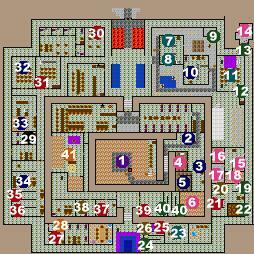 The last room is the Tower Temple. In here you'll find Clarisse. She'll sell you some priest spells. I've heard rumors that praying at the altar here can cure Dread Curse, but haven't confirmed it yet. There's a small secret room in the southeast corner of the temple where the Priest dress before services. There's also a secret room in the northeast corner of the courtyard which contains some gardening supplies. Head out of this courtyard, but instead of entering the main courtyard turn up the hallway. Follow the passage around until it heads south for the second time. This section of wall has another secret room, with a Giant Lizard. Now head south down the hallway until you get to a door. This is the secondary holding area. There are four rooms containing a Poison Fungus, some slimes, a Drake and a Wight. The room with the Wight has some Lab Notes in the corner which you want to pick up. Go back into the main hallway and head south again. Use the mini-map and when you get past the holding area start checking the western wall for the secret entrance to a library. This is where X hangs out. He'll give you your rewards for the Troglo/Giant Quest and for the Golem Quest. Check the bookshelves. One of them contains an Arcane Blow scroll. Back into the main passage again, and start checking the wall again when you reach the blank area. This is the Triad Meeting Area, which you can't enter. The next doorway along the main passage is for the room containing the Portal to the Vahnatai Lands, which isn't used anymore. Do not approach this portal. The next room is Brantford's shop. Brantford sells an assortment of useful, semi-useful and completely useless items. Check out what he has in stock, and take anything that you feel might be useful. Once you get back into the main passage go west until you reach the pool. Check out the northern wall here, right before it curves to the north. There's a secret passage, which is blocked halfway along with a barrier. You need either Dispel Barrier Lv.2 or a Piercing Crystal to get past it. Behind the barrier is an Energy Pulse Mind Crystal, which you don't want to use, and tome that teaches Arcane Summon Lv.2. Go back to Brantford's shop and dispose of the Mind Crystal, then continue going along the passage, ignoring the stairs leading to the north for now. Keep following this main passageway. The next door in the hall leads to the Council Chambers, and the one after that leads to a barracks, which you unfortunately can't loot due to the lazy soldier sitting at the table. The next room leads to a small library. Check the desk for the Xian Tome, and then go to the top of the room. Behind this door is an Item Augmentation Platform. Go back into the main hallway and keep moving along. There's a long stretch before the next door. This door leads into some guest quarters, and the door leading off of here is a room in which you can rest. Keep following the passage until you find yourself again in a doorway to the Main Courtyard. Head towards the west now, exploring the rooms as you go. The southeastern room in this section is another Dining Hall. Across the hall are the Apprentice's Chambers and a room containing six tomes. The only tome of note is the northeastern one, which contains a note about Linda. Check out the sleeping areas of the Apprentice's Chambers, as there are a couple things in some of the chests that are worth picking up. Just remember that if they can see you, you can't steal, so shut the door. Continuing along this inner hallway you'll come to an empty classroom. Shut the door and get the Research Tome from the bookshelf, then go to the next classroom. You'll find Kyanan in here. This is who Vincent said you should talk to about Linda, so do so. This hallway now takes a turn south. There's a doorway on the western wall. Inside this room you'll find Carrie. She's in a bad mood because she dropped her Lab Notes in the Wight's cell, and she can't get it back. Lucky for you you already picked them up. Give them to her and she'll tell you about a magical cloak she hid in a store room near the Mage's Chambers. Go down to the end of the inner hallway now, and you'll find yourself in the Tower Library. You'll find Conruc wandering around in here. He's very concerned about Linda's presence in the Tower, and suggests that you talk to the Triad about it. You can if you choose, but it won't do any good. Check out the aisles of bookshelves now. There's a book at the end of one of them. If you read it you'll get some useful information about the spell Forcecage. Now go down to the last aisle, and, after checking to make sure no one can see, take the Research Tome and Slow scroll you'll find by searching the bookshelves in this row. Remember those stairs at the southern end of the Tower that I told you to ignore at the time? Well, now it's time to go back down there. Go up the stairs and through the door to the west. The first room is Denise's Chamber. She gave you a quest to bring her her amulet from the Tower, so go into her chamber and check the dresser. The next room is Solberg's. He'll teach you Ice Lances Lv.3 now, and he'll teach you another Lv.3 spell once you've dealt with the Roach Plague. The last room on this side of the hall is empty. There's only one door on the other side of the hall, and it leads to Linda's Chambers. Don't bother getting rid of the Barriers blocking the passage, because you still won't be able to get into her room. You have to wait until after Day160 to get in there. Leave the hallway back to the east and go through the doors on that side. This is the storage chamber where Carrie left that cloak. It's under one of the piles of sacks. Now instead of trudging all the way back around to the Main Couryard, check the eastern wall of the storage room for a secret passage. It zigs back and forth a little bit before coming out into the chamber that used to contain the Eye Beast. Note that the secret entrance on this side is a couple steps north of the end of the passage. Now head back to the Portal and up to the Portal Fortress. Don't forget to stop and give Denise her amulet in the Fortress, and any research tomes you picked up to Walner. Then head back to Fort Emergence. Stop in Anaximander's office, and he should give you a quest to investigate some murders near New Formello.